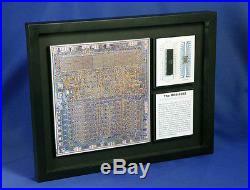 This artwork is a mixed media display celebrating the MOS 6502. The 6502 processor introduced in 1975, was MOS first successful product. Although influenced by the design philosophy of the Motorola 6800, the 6502 is clearly a different and more advanced chip design. This artwork includes 3 major elements. It has a large image of a MOS 6502 chip. On the back is a narrative describing the artwork and the 6502, and the artists signature. Also, included is a MOS 6502 chip in a black poly resin 40 lead DIP (Dual Inline Package) package. The fully functional chip is mounted with threads and is surrounded by an enlarged diagram of the chip with the electrical signal designations for each of its leads. These artworks are the creation of ChipScapes. Are photographs taken of computer chips, boards, and other computer artifacts. They are sort of chip landscapes, or ChipScapes. Most often a macro-lens or microscope is used with special lightning to achieve these unique artworks. Intel, IBM, Fairchild, DEC, Signetics, Intersil, AMD, Zilog, Motorola, MOS, NEC, Texas Instruments, are some of the great chip making companies. Chips like the Intel 4004, MOS 6502, Zilog Z80, AMD 2901, IBM PowerPC and others have changed the way people work and play. Are dedicated to preserving and sharing these computing and communication technologies that changed the world. Works of Art are fine collectible artworks. Would make a great gift for the nerd, geek, engineer, programmer, IT executive, or just that technology savvy person in your life. Limited edition size of 50 (production may be further limited by lack of availability of artifacts). 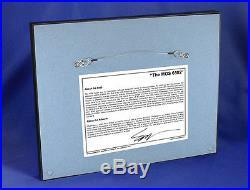 The artwork is framed in an 11"x14"x1.5 black shadow box frame, with glass. All framing materials are acid free. A narrative about the artwork that includes the artists signature is placed on the back of the artwork. Chips and other artifacts are mounted with threads and/or acid free materials. Are a new and exciting art form with bright colors, bold patterns, and interesting textures. Have been recognized as unique in their relevance to our cyber culture and our pop culture. My art provides an edge for the decorator in our high-tech society. I can provide swaths of artworks for color matching purposes. If different colors and sizes are needed for your requirements, let me know. See my FAQ for more information on how I work with decorators. For more information about ChipScapes. The item "The MOS 6502 The Hobbyist's Microprocessor (Atari, Apple, Artwork, ChipScapes)" is in sale since Friday, March 30, 2018. This item is in the category "Art\Mixed Media Art & Collage Art". The seller is "chipscapes" and is located in Winter Park, Florida. This item can be shipped worldwide.